It’s that time of year again: St. Patrick’s Day is upon us. This year, up the ante and the festivities by taking it farther than wearing green. 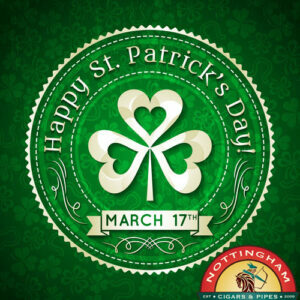 Stop by Nottingham Cigars & Pipes to celebrate with some seasonal St. Patrick’s Day releases including green cigars, St. Patrick’s day pipes from Ireland, Zippos and shamrock shake juice. We were able to get our hands on 10 boxes of these green beauties! Be sure to stop by one of our Edmonton cigars shops to get yours while they still last. 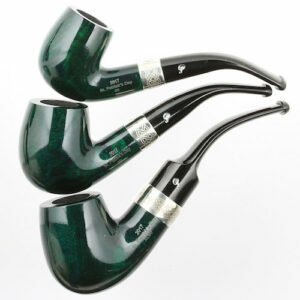 “A thinking man smokes a Peterson Pipe” and St. Patrick’s Day is no different. This Dublin-based company does St. Patrick’s Day right with their 2017 Limited Edition Peterson St. Patrick’s Day Pipe by keeping with the festive spirit without deviating from quality. The company originally started with master craftsman Charles Peterson. Today’s Peterson Pipes honors Charles’ understanding of the subtlety for materials, and the tastes and preferences of discerning smokers. This year’s collection includes pipes in four different sizes and styles, the St. Patrick’s Day 221, St. Patrick’s Day 68, St. Patrick’s Day X105 and the St. Patrick’s Day XL02, as well as the 2017 St. Patrick’s Day Limited Release Tobacco. We have the Peterson 2017 St. Patrick’s Day Pipe in stock along with past special releases from 2016, 2015 and 2014. Looking for a little luck of the Irish? We have a number of different models of Zippo lighters that sport shamrocks and clovers for a St. Patrick’s Day theme. For vapers we are featuring a Shamrock Shake vape juice that has all of the flavor (but none of the calories) of this delicious dessert. Whatever your St. Patrick’s Day celebration style, Nottingham Cigars & Pipes has something to make your day a little more festive.